So you’re looking for a Vitamix blender? That tells me two things about you, you’re looking for the best of the best in your blender, and you’re incredibly good looking. Ok so I’m just guessing on the second one but I’m sure of the first one. Because Vitamix make incredible blenders, not just “use it once to make margaritas for a party” style blenders but real “I care about my health and want to use my blender as close to every day as I can” blenders. But knowing which Vitamix to get can be hard, there are so many different models to choose from which is why I put together this guide. I wanted to review every single model of Vitamix currently available so you can find a review of the one you’re interested or find get the best one you need. If you have a model in mind you’d like to look at hit one of the links below to jump to it, otherwise, let’s take a look at what makes the Vitamix so incredible. If you haven’t noticed, I’m a Vitamix fangirl, but for good reason, a few of which I’m going to share with you now! 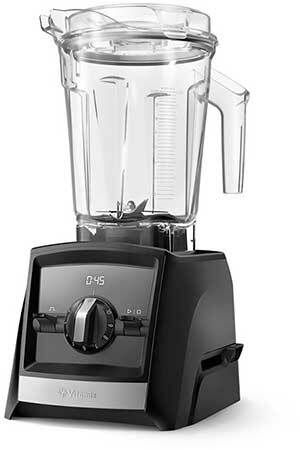 It sounds a bit counter-intuitive, but Vitamix blenders actually use a Hardened stainless steel blade that is completely blunt. Sound like it wouldn’t blend anything? Well, you put enough power behind it and it can in fact blend pretty much anything. Plus the downside to having a sharp blade is it goes blunt over time and the quality of the blend goes down, with Vitamix it just keeps blending day in day out, year after year, decade after decade! When you’re buying a premium product there would be nothing worse than using it for a year or two for it to stop working. Well, Vitamix have made an heirloom quality product that will survive long enough to be passed down. They’ve got a 7 – 10 year warranty (depends on the model) on parts and the parts themselves are designed to last, metal connectors that don’t wear out and a specially cooled motor that won’t overheat and burn out. You’ll find a lot of professional kitchens have a Vitamix in the back helping them out with everything they need from soups to sauces, and if it’s good enough to last in a professional kitchen it’s good enough for the home! I always enjoyed watching Hell’s Kitchen when they bring out the Vitamix as a prize, everyone goes wild and I just get it. It’s my guilty pleasure TV, don’t judge me! This probably could have gone inside another section but I thought it needed to be highlighted on its own. IT’S SELF CLEANING! Don’t get me wrong, I absolutely love juicing and everything surrounding it, but having to clean up after is nothing but an absolute pain, getting parts that go in the dishwasher helps but self-cleaning is just the next level. After you’re finished using it you just fill it up with water, squirt in some dishwashing liquid and turn on the cleaning setting, it spins away and you pour out all the dirty water after! It’s just the next level of convenience. 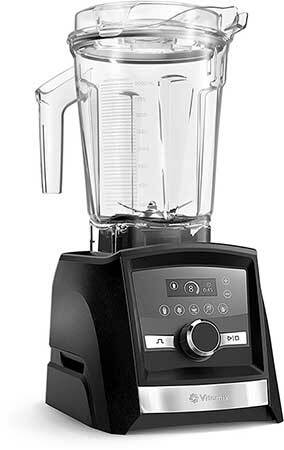 I could keep going on about all the great things Vitamix has to offer but I think you get the picture, they’ve worked hard to make the best blender, it can’t be denied. But before we get into the bulk of the reviews I want to talk about refurbished models. 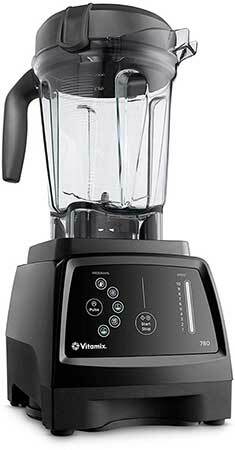 Are Refurbished Vitamix Blenders Still Good? You can get refurbished Vitamix that are sometimes quite a lot cheaper than a new one, but what’s the difference? Generally, refurbished models are blenders that have been returned for one reason or another, maybe a faulty part, an unwanted gift, something like that, they then get thoroughly inspected and tested and any parts that need it get replaced. So really it depends on your preferences for second hand, if you like buying second hand then this is the best you’ll get. But if you’re more risk averse then I’d stick to a new one with the full 10-year warranty. 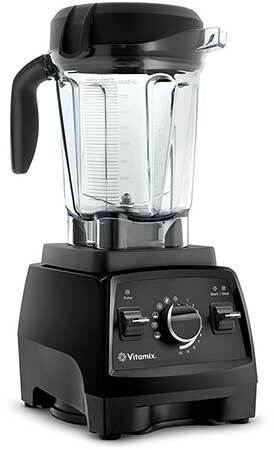 Yup, all 13 of the current models of Vitamix reviewed and compared so you can find the one you need. I’ve started with the 3 best and most popular models available so if you’re stuck for choice those are definitely a safe bet. I’ve linked each one through to Amazon so you can click through and order yours today! Just click the Price & Reviews button and you’ll be taken to the relevant model. This is the latest Vitamix release, and they’ve gone digital! 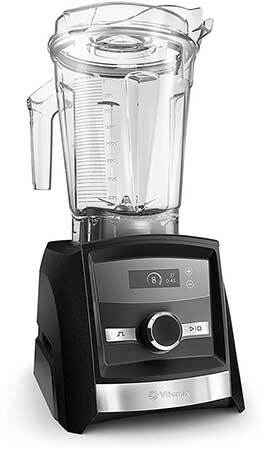 You get all the same Vitamix blending power but now it has a digital display, touchscreen controls and smart technology that detects what size of container you’ve attached so it can adjust itself accordingly. Plus if you download the app you get an additional 17 program settings and access to 500+ recipes. So for those who love technology and getting the newest model this is perfect for you. 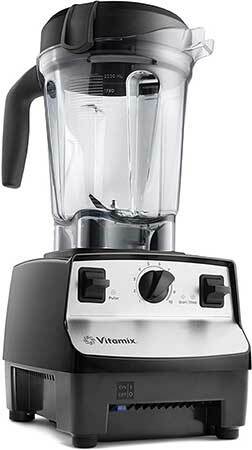 It’s one of the most expensive Vitamixes but for that price you get the top of the range blender. Also because they connect to wifi and it means they can update as any new features come out so it will evolve with the technology as Vitamix develop it! 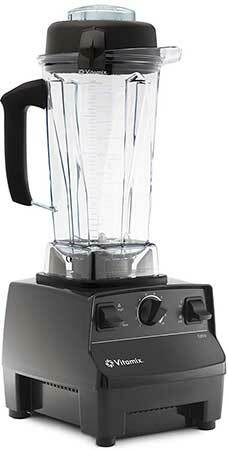 The same goes for all the smart blender series from Vitamix. If you’re serious about blending but have no interest in having a digital blender then this is the one for you. A nice low profile means it fits nicely in the kitchen while the 5 pre-programmed settings and variable speed controls give you complete control over cooking. Whether it’s smoothies, soups, doughs, whatever you’re making the pro 750 can handle it. The pulse isn’t a standard on all Vitamix blenders so it’s really nice to have that extra element of control while you’re using it to get the exact finish you want. 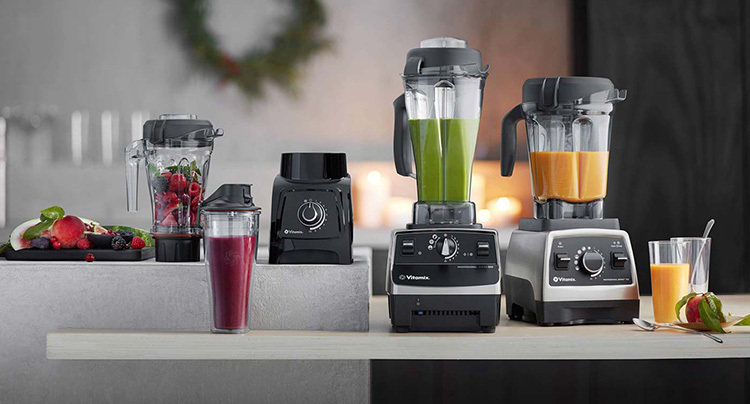 The Vitamix 5200 is a standard across all the Vitamix range, it’s the perfect model for people looking for simple powerful blending. It’s got a variable speed switch with 10 different speeds on it, no pre-programmed settings so you’ll need to do it manually but the same ol’ power and functionality that Vitamix provide. Even easier if you don’t want to play around with the variable speed settings there’s one switch that sets it between max and variable and another that turns it on and off. So you can just set it to max leave it there and blend by turning it off and on again. Just be sure to keep an eye on it if you like to have a bit of texture in what you’re making. This is the older version of the A3500 featured further up, the same self detect technology that detects which container you’ve put into it but it’s only got 3 pre-programmed settings and no touchscreen controls. Well it’s a bit cheaper than the A3500 but that’s the only real advantage. Although, what is cool is you can also connect it to the app to unlock the 17 different preprogrammed speeds to use. So still a great blender but I’d probably it doesn’t offer any advantage over the A3500. Not a very common blender because it’s essentially the little brother of the A3500, it’s got an adjustable speed selector on it and the same digital display but not the pre-programmed settings. So again you get the price cut off the bigger model but in return, you get limited usability so again I’d personally go with the A3500, but if you can’t afford it this one will still see you right. Again this is the little sibling, this time of the A2500, all that great blending power but without the preprogrammed settings that offer that extra level of control. So once again I’d personally go for the A2500 for the complete experience since it’s not that much more expensive. The E 310 Explorian is a great small blender, the smaller container size lets you make smaller batches so you’re not letting anything go to waste. It doesn’t have any pre-programmed settings but it does have the 10 variable speeds and a pulse switch giving you plenty of control. What’s also great about the smaller size is the smaller price tag, so if you’re just making smoothies (or any of the other many things a Vitamix can do) for one or two people you don’t have to splash out on a family sized blender that you might struggle to fill the minimum of. Because the 7500 is similar to the 750 except without the pre-programmable settings, the base is the same G-Series and it shares the same power and other specifications. So if you like the preprogrammed settings (as I do) then you’ll want the 750 otherwise you can go right ahead with the 7500. I’m not 100% sure but I have a feeling that the 780 series might be getting phased out, it doesn’t seem as widely available as a lot of the others, and it’s main feature, which is the touchscreen, is now available on all their A models. But regardless of that this is the one fancier than the 750, it’s got the 5 main pre-programmed settings and a fancy touchscreen display which you use to control it. Pretty nifty but surprisingly expensive still considering the price of the A3500 which has similar features and more. 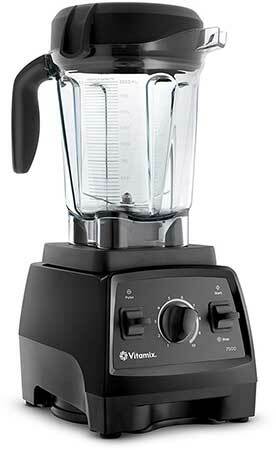 This is the most basic Vitamix you can get, it’s just got two speeds (as you probably figured out from the name) so it runs on high or it runs on low. If you’re looking for a Vitamix that’s a smoothie maker then this is the one for you. It’ll blast up a smoothie in no time and it’s not too expensive either. The only other difference is it doesn’t have the low profile container that’s common on most of the other models, it featured the taller jug which actually makes it better for smaller batch smoothies. They stepped up from the Turboblend adding in a variable speed control on the 5300, it’s got a slightly more powerful motor than the 5200 with 2.2hp as well. Plus you have the nice low profile jug so you can store it a bit easier. The main difference is the variable speed control though, giving you that little bit more control over whatever it is you happen to be creating. 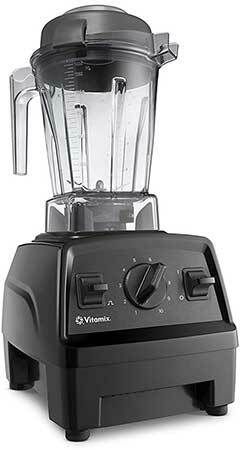 Vitamix actually have two small personal blenders which a lot of people forget about. Everyone loves a good pre-programmed setting, at least I think so and so do Vitamix which is why I keep going on about them. Nice and easy to use it and it comes with two different sizes of cup. I don’t think you’ll find anything better for making an on the go smoothie. And once again the difference is that this doesn’t come with programmed settings, though it is once again a bit cheaper and has the 10-speed variable controls so you still have a lot of control, you just can’t set and forget once all the ingredients are in it. And there you have it! If you’re still here, hopefully you’ve found your perfect blender ordered it and are currently happily sipping down some delicious smoothies. If you still have no idea what one to get go for the Pro 750, it’ll see you right.